Here are some of the best ideas and activities for toddlers and young kids visiting Anna Maria Island Florida. With 3 kids of my own ages 1, 4, and 6, these are things that I know would keep my own kids entertained, having fun, and wear them out for a great night’s sleep at the end of the day! If there is one thing that our family loves to do it is travel! It can be a challenge at times with very young kids, but almost every place we go offers some great activities for young kids that makes the vacation very family friendly and fun for everyone. Although I have been all over Florida, I had never been to Anna Maria Island until recently. This tiny island quickly captured a large part of my heart. The beaches are pristine, the people are extremely friendly, and the Island exudes character that you rarely find anymore since it is still primarily comprised of smaller locally owned businesses instead of mega chains of hotels and entertainment. Not only is Anna Maria Island beautiful, but it is also a great place for families, and especially those with toddlers! One of the biggest reasons is that the island is not overly large. It is big enough to have lots to do, but small enough that everything is easily accessible. You don’t find long lines, crazy traffic or other headaches that are multiplied tenfold when experienced with little ones. Go to the Beach! Well we are in Florida of course, so my number one recommendation is to spend lots of time in the sand. I love the Holmes beach for toddlers. It is long and flat with plenty of clean, beautiful, white sand and sand bars that create lots of shallow water for young kids to play in. The best part was when we were there on a weekday in early August, the beach was not crowded at all even in the peak of the day. My friend Julie that has traveled many times to Anna Maria Island with her kids has a post all about her favorite beaches on Anna Maria here for some other ideas.A great tip for the beach is to inquire with your lodging if they have any beach items to borrow. At the Tortuga Inn where we stayed they had all sorts of things for guests to borrow and take to the beach. We took umbrellas and beach towels with us that made a nice amount of shade that would be perfect for little ones to play under. 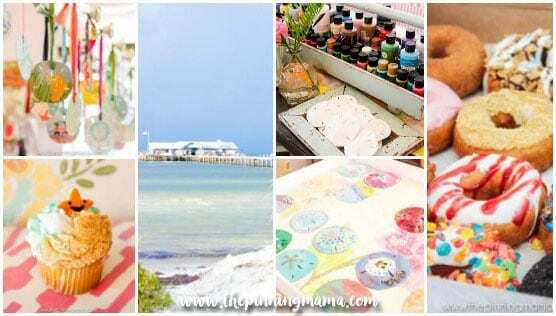 Paint a sand dollar – This is one of my favorite activities from my trip. The Shiny Fish Emporium is one of the cutest little boutiques on Pine Ave. When the owner envisioned the shop, she wanted a place that children could enjoy just as much as their parents and she has brought that vision to reality with a shop decorated in whimsical decor featuring unique heirloom quality toys, hand curated clothing and gifts for adults, treats like Mochi Ice Cream, and the highlight, a large table where you can hand paint sand dollars!The staff will set you and your little ones with with smocks, sand dollars, and 100’s of colors of paint and let you paint away and get as creative as you want. Once you are finished they will add glitter to make it sparkle just like the ones you see in the souvenir shops, then let it dry. Once it is dry, they add on a ribbon for you to hang the sand dollar or use it as a Christmas tree ornament, then package it up safely for your trip home. This is a hidden gem in Anna Maria Island and one that can be enjoyed by toddlers to teens, and even mom and dad! Get Donuts – When you arrive in Anna Maria Island, you might not know that you are right next to one of the most delicious donut places in the US! You will need to make a trip to The Donut Experiment at least once while you are there to experience the made to order donuts. When you arrive don’t be surprised to find the line extending out the door, but don’t worry… It moves fast, and it is worth it for the yummy donuts and the experience of watching them make them right in front of you!When you get there, make sure to grab an order form. On this you will record exactly how many you want and what you want on them. This process makes it really easy to order as many completely unique donuts as you want without it being really long and confusing. You will see multiple options of glaze, toppings galore, and even a drizzle of choice! My favorites were the peanut butter chocolate combo, and the strawberry frosting (but not together!) and the Sriracha donut was surprisingly good too! Let your kiddos get creative and enjoy this fun breakfast outing! 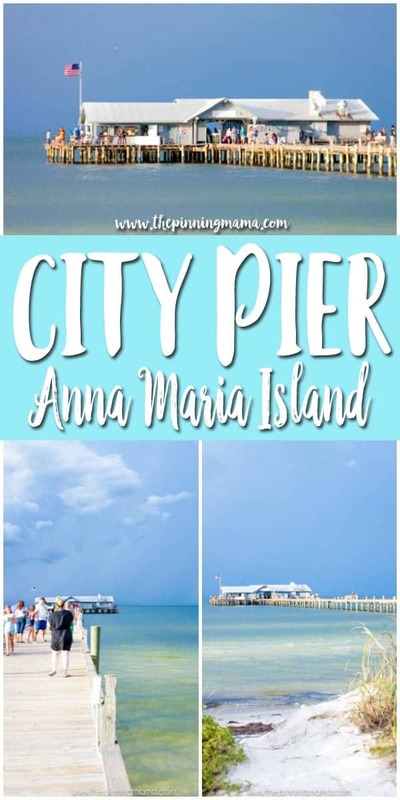 Go to the Anna Maria Island City Pier– The City Pier is a really fun place to get to go out over the water. It is a pretty long pier and free to walk out on, but be warned, there are no railings on a good part of it, so if your toddlers are especially wiggly, you might put them in a stroller for this. The views are beautiful and you can look for fish, sometimes see dolphins, and get to enjoy the sounds of the ocean. There is even a restaurant if you want to enjoy a meal. The City Pier Restaurant is great for family dining with a selection of soups, sandwiches, seafood specials, and a special kids section on the menu. Go for a Swim– Most of the inns and resorts on the Island have a pool on property. We stayed at the Tortuga Inn and loved taking a break in their pool. It is an easy stress free way to enjoy some family time all together or entertain little ones while others are napping or busy. It is the perfect thing to do in the morning while other family members might be getting ready, or after a day at the beach to get some of the salt off. Cupcakes– If your kids love sweet treats as much as mine, then definitely pencil in a stop to Cupcake Delights Bakery. This little gem has some of the best cupcakes I have ever sampled. They make them fresh every morning and have a menu of over 100 flavors that you might get the chance to try that day. 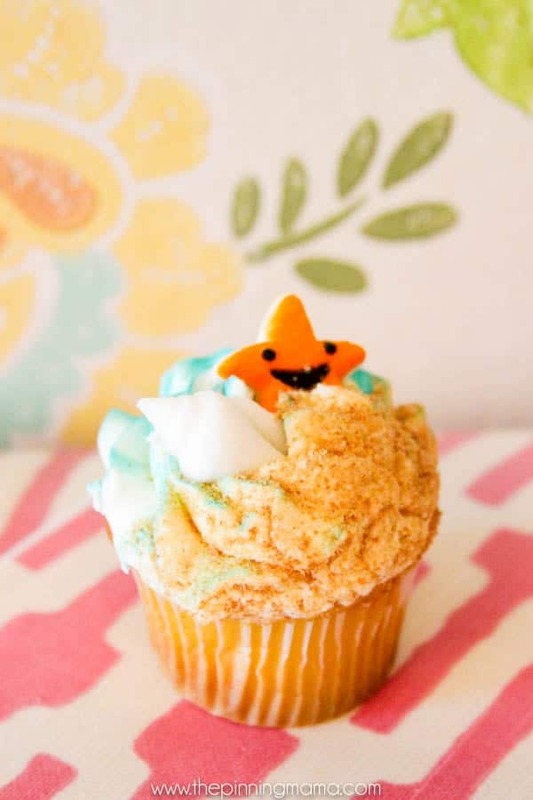 There is everything from gourmet flavors to classics, and even adorably decorated beach cupcakes that are guaranteed to deliver smiles to faces little and big! Hunt for sea shells – Hunting sea shells has been a favorite activity for each of my kids as soon as they were able to walk. This is a great activity for toddlers since they often wake up with the sun, and the best time to grab the prettiest shells is always first thing in the morning. You can find shells on any beach, but I got a special tip that the shelling was the best in the area on what is known as Beer Can Island (Greer Island.) I didn’t get to go to it personally but the locals said the shape of the island makes it especially perfect for grabbing beautiful shells, so if your little one loves to look for the best shells, definitely add this to your list of things to do! Eat with your toes in the sand – The Sandbar Restaurant is the only place on Anna Maria that you can actually eat with your toes in the sand. This locally owned eatery has an expansive patio, with many tables actually over the sand, and absolutely priceless beach views. The casual atmosphere makes it perfect for kids, but the menu will be pleasantly surprising for the adults. With prime seafood, and even specialties like bison sliders, and my favorite the fried squash blossoms, this place will not disappoint for anyone in the family. I recommend going a little before sunset because not only is it one of the most spectacular views of the sun setting over the water on the Island, but they also host a fun contest every night for the timing of the sun going down. Go Play and Enjoy the Views at Bayfront Park– Sometimes your little one just needs to run around and get some energy out. Bayfront Park isn’t huge, but it is perfect for little ones and has beautiful views of the bay for the parents! If you are looking for something quick, easy, and free, then this is a great activity to add to the list. Play Miniature Golf – Even if your toddler is barely walking they will still have fun getting the ball to the hole in a game of miniature golf. It is a great activity for littles ones since it is in an enclosed area, there are lots of fun things to look at, and all toddlers love balls, right? I didn’t get to play, but I loved the look of The Fish Hole Adventure Golf. Not only is it a fun little course, but it is also on Bridge Street which is full of other shops, restaurants and activities, so you can spend a whole morning or afternoon there. These 10 things should fill up the better part of your trip to Anna Maria Island with your little ones! If you go, I would love for you to leave me a comment on what you did and let me know if there are any other hidden gems for toddlers and young kids. I am always looking to add to the list here and my own of things to do on our next trip there. Thank you so much for these tips! We are going in April with our little toddler & can’t wait to try these out! Great ideas- we ended hitting most of these spots and really enjoyed them, my daughter especially loved creating her own doughnut! So glad you enjoyed it Liz! I have been dreaming of going back. I am very jealous!! We’ve been going to Anna Maria Island for years pre-kids, and now we’re planning to return this summer with a 2 year old and a 9 month old. Thank you for these great ideas! AMI really is a slice of paradise. I can’t wait to go back! Don’t forget Anna Maria Island Beach Cafe on Manatee Ave, I think it is where you can sit on the beach, play on the playground, play volleyball, shop in a little souvenir store, eat at the cafe and drink 🙂 we love this place. I always have my feet in the sand and it’s kid friendly. Best part. Loved your post. We live in South Florida and didn’t even know this place was in our own backyard. Curious..where did you stay? Having a hart time finding a place on Airbnb. Thank you!! We stayed at the Tortuga Inn and LOVED it! There are regular rooms and large multi bedroom suites. It is right across from the beach (super easy walk with kids) and they even supply umbrellas etc you can use while you are there. I hope your stay is as magical as ours! Just got back from Anna Maria. It has stolen my heart. I already plan to go back next year. We did 6/10 things on your list. Next time, we will get to the other 4. Thank you! This helped so much. Hi! We’re planning on going to AMI next month or February. I’m conflicted about which beach area would be the best for us to book an airbnb, Holmes beach or the southern point of bean point (near Sandbar restaurant). We’ll have three toddlers and we want the calmest most shallow beaches to spend all day with them. Which area would you recommend? PS, this post is awesome!! Hi K! Holmes Beach is best for toddlers. It’s flat with sandbars so there are shallow places for the kids. I love your top 10! AMI is one of our favorite places to go! Besides the things you mentioned, we love going to the Island Bazaar in Holmes Beach. They have talking parrots that three years after the fact, our son is still talking about. We also rented kayaks from the Surf Bus and toured the mangroves. Other fun things to do if you go back and worh the drive is the Marie Selby Gardens and the Mote Aquarium in Sarasot as well as St. Armans Circle.